River Park grand opening 9/23. 11am-1pm. Bring your friends, for kids, and your kids friends! River Park Disc Golf Course Grand Opening is September 23rd. Come out and make a great showing for disc golf! Media is expected to be on-site during the day to potentially do some player interviews and take pictures. I'm guessing most media outlets will be there during the morning or mid morning. Next Weekend is the Basket Assassination. We will have some Ultralight Honeys available for purchase with your funny money. The Mishawaka Meltdown A-Tier is coming up April 2-3, 2016. Players who sign up by March 1st will receive a personalized shirt along with their player packs (Glass mini, stool, and clipboard) confirmed. This is an Am Nationals qualifying event top 20% of Am1/Advanced qualify. Winners of Adv, Int, and Rec get portable baskets. Do pros get those player packs too Larry? No sorry Jeff pros just get cash. NEXT EVENT is the Basket Assassination at Robert Morris B-Tier Event Added cash for Pros, Food and Drinks provided at lunch, Daredevil Discs to check out and Evaluate and Win! November 7 and/or 8 depending what division(s) you want to play! 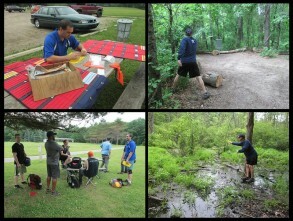 Daredevil Discs sent us a huge pack of discs for player evaluation at the Swampthing challenge this weekend. Come out and try some sweet plastic! We got some great prizes for the ultimate summer Showdown this weekend. Come on out to coldbrook park August 8, 2015. Yea, No one has claimed that $$$ yet although I came close on hole 8 at Osh. Sadly I cannot collect :( Well All ams at ledgestone get a honey and we will see if that means $$$. Holy Oaks at Addison is looking like a great day for disc golf. Even the weather has cleared and ready for us. Looking forward to seeing everyone out there in the morning! Holy Oaks PDGA C/B tier at Addison Oaks this Saturday. Don't forget to preregister!!! The Mishawaka Meltdown B-tier event at George Wilson Park next Saturday April 18, 2015 is a USADGC (Am Nationals) qualifying event! Sick of playing against the same people? The Mishawaka Meltdown offers a great opportunity to test your metal against players from a 3 to 4 state region while not costing an arm and a leg! April 18th George Wilson Park. Be There! Pre-Paid Registration closing soon for Leprechaun's Last Stand. See you tomorrow ADV and Rec Players! Sunday for the Pro and Int guys! Just looked at the weather for this weekend's Leprechauns Last Stand Event and it is shaping up to be two beautiful days of disc golf at oshtemo park! For those of you looking to do good this weekend and have never been to our beautiful course in watervliet, I invite you to come play with us for the ice bowl this Saturday January 31, 2015. Threw a honey on a hyzer and landed in the fairway just before getting out of the woods, then threw a honey upshot on a forehand going for it was just right to stick. I witnessed that shot, it was pretty damn awesome. Less than a week before the Basket Assassination! PDGA C/B Temporary Insanity October 19th at River / Benton Twp. Park in Benton Harbor, MI this is 100% temp course with the potential to turn into a new Berrien county Disc Golf Course. Come out to play, Come out to watch, Come out to enjoy yourself and support the growth of the Sport! Displaying 1-20 of 97 total board posts. Anytime I need a mid drive or approach to hold a predictable line.